For the second time within two weeks, another global warming skeptic blogger has had his Twitter account suspended, this time repeating profanity used by a NASA climate scientist — and no the scientist did not get his account suspended. On April 1st, Twitter locked the account of science blogger Tom Nelson, who runs the blog the "Hockey Schtick." Twitter told Nelson to delete a tweet that contained the word — are you ready for it? — "crap" or else his account would not be unlocked. Nelson then posted the "Delete Tweet" screen to his blog, after which Twitter promptly suspended his account. As of April 2nd, Nelson's account was still suspended. Interestingly enough, Nelson was simply repeating a word used by NASA climate scientist Gavin Schmidt who tweeted at Nelson that [graph] is crap as I've frequently pointed out. The temperature is hand drawn. Not even you can take it seriously, surely?" Nelson tweeted back on March 22nd "is this graph crap too?" About a week and a half later, Twitter locked his account and the suspended it. But Gavin Schmidt's account has not been suspended — which has raised the ire of other global warming skeptics and conservative pundits on Twitter. 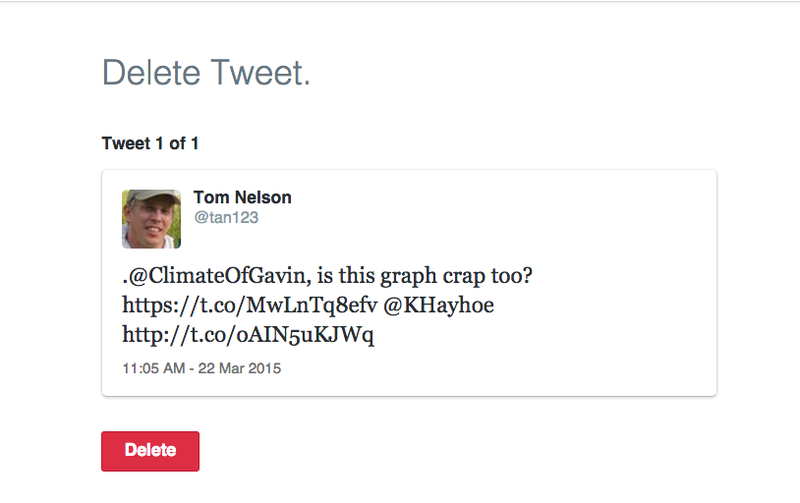 "If calling a graph 'crap' is grounds for suspension, why isn't @ClimateofGavin suspended?" Nelson asked on his blog.
.@ClimateOfGavin You wouldn't happen to know why @twitter "suspended" another climate dissident, Tom Nelson @tan123? #BigClimateEnforcers? Nelson's suspension comes within two weeks of Twitter suspending global warming skeptic Steven Goddard, a noted blogger who has been labelled as a "denier" by environmentalists. Goddard, a pseudonym he blogs under, was suspended for violating Twitter's rules. Goddard had been previously warned by Twitter of that other users had accused him of "non-violent threats" and "abusive behavior." Goddard denied these accusations. "I have never violated any Twitter rules, and Twitter has failed to respond to my requests to provide any details," Goddard said. Both Goddard and Nelson have been highly critical of views human activity is causing the planet to warm at an alarming rate. InsideClimate News even featured Goddard on its "Who's Who List of Climate Denialists" — list put together by environmentalists of global warming "deniers" targeted by email hackers. But Twitter's actions against the bloggers seem to come from complaints by other Twitter users. Indeed, Nelson's account was locked about a week and a half after he used the word "crap" in a tweet. Some in the skeptic community have suggested climate scientists and environmental activists are complaining to get skeptic's account suspended. Indeed, Penn State University climate scientist Michael Mann has threatened "trolls" with being reported and blocked if they interrupted a #AskDrMann session on Twitter. But Twitter doesn't disclose such information. So any accusations of who is behind getting skeptics' account suspended is speculative at this moment.